Below please find an update on the total number of units sold short across the three Atlas Energy entities (as an indicator of how much traction Hedgeye’s short thesis is achieving in the market place). 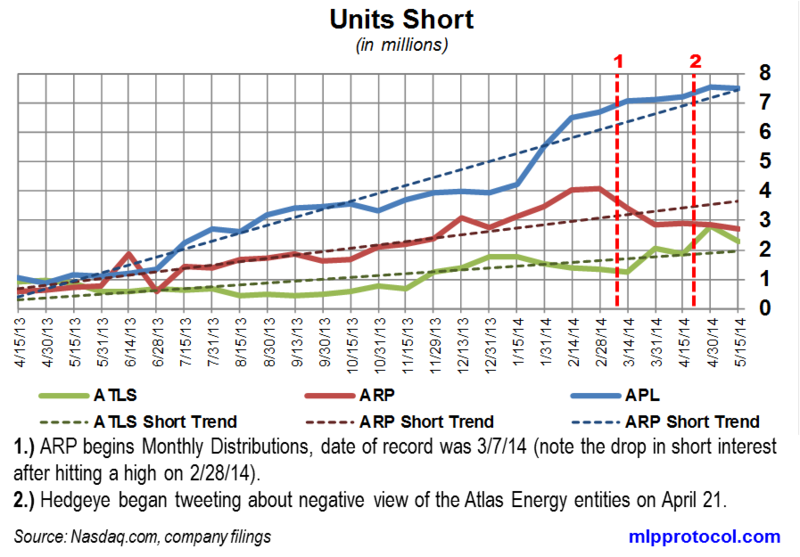 The following chart shows the total number of units sold short for each name since April of 2013. The data is somewhat delayed, typically 10-12 days. Even though it is relatively recent, Hedgeye’s short thesis appears to be gaining traction with market participants. I would expect that trend to continue. If you are a retail investor and playing along with shorting these names, please pay attention to the Ex-Distribution dates so you don’t also have to pay the distributions. In addition, you should also take into account your additional cost to borrow each security from your broker. Many MLPs are naturally “Hard to Borrow” so assuming your broker finds you units to borrow to short, they may charge a high rate. This entry was posted in Atlas Energy Group Short Interest and tagged $APL, $ARP, $ATLS, Atlas Energy, distributions, dividends, Master Limited Partnerships, MLP, MLPs, yield. Bookmark the permalink.